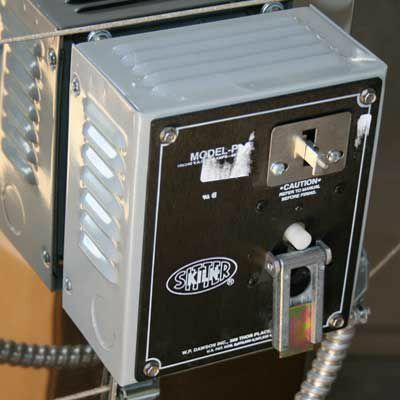 Nearly every electric ceramics kiln comes equipped with a kiln sitter. Before your first firing in an electric kiln, it is essential you become familiar with the kiln sitter; most electric kilns will not operate unless the kiln sitter is properly armed. This is a view of the exterior panel of the kiln sitter. Note that it has a hinged plate that swings upward and a latch that can catch and hold the plate. When arming the kiln sitter, you will lift the plate up and hold it in place flush to the panel. The kiln sitter extends from the exterior panel to the interior of the kiln. Here we see the interior parts of the kiln sitter. The round pipe is made of highly refractory material and helps protect the unexposed portions of the kiln sitter from the high temperatures. The two prongs and the lever bar are all made from highly heat resistant metal. The prongs will support the pyrometric rod or cone used. The bar is the end of a lever whose other end is the latch on the external panel. To load the kiln sitter, lift the plate on the kiln sitter's exterior panel and position it behind the latch. Lift the interior lever bar at the same time. This will cause the exterior latch to drop, thereby holding the plate into position. Keeping the interior bar elevated, slip the proper cone or rod between the prongs and the upraised lever bar. Allow the bar to gently drop onto the cone or rod. The kiln sitter is now loaded. Make sure to load the kiln sitter before you finish stacking or loading the kiln. It is extra work and added possibility of damage to ware to have to partially unstack the kiln because the kiln sitter had been forgotten. When using a kiln sitter, you need to determine which pyrometric item you will use. To begin, we can narrow the field down somewhat by eliminating large pyrometric cones, including those that are self-supporting. Small cones (sometimes referred to as junior cones) were developed for use in electric kiln sitters. Later, pyrometric rods were also developed. The difference between the small cones and the rods is that the rods do not taper. Thus, rods consistently bend enough to shut off the kiln at the cone they are rated for. This is not the case for small cones. 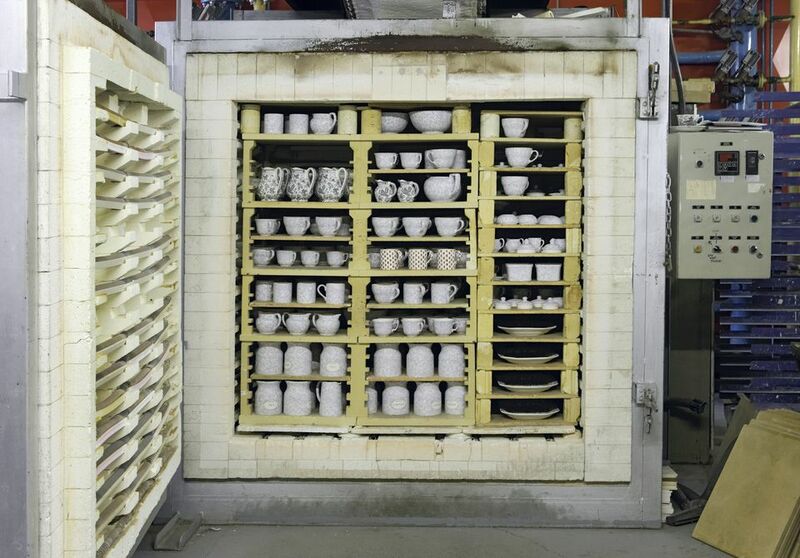 If the small cone is placed to one side or another, the experienced potter can adjust the kiln's ending temperature by a noticeable amount. Centered on the prongs, the small cone will bend (shutting down the kiln) at the proscribed cone rating. If the lever bar is resting on a thicker portion, it will be a hard firing. If the lever bar is resting on the thinner portion, it is the equivalent of a tipped firing. Once the cone or rod has been placed in the interior portion of the kiln sitter, the sitter must be still be armed in order for the kiln to function. Double check that the plate is held by the latch on the extreior panel. Once the kiln has been loaded and you are ready to begin firing, push the button that is now inset in the open area of the plate. This will close the electrical circuits, allowing electricity to flow into the kiln's switches or controller. The kiln sitter is now armed and ready for firing.